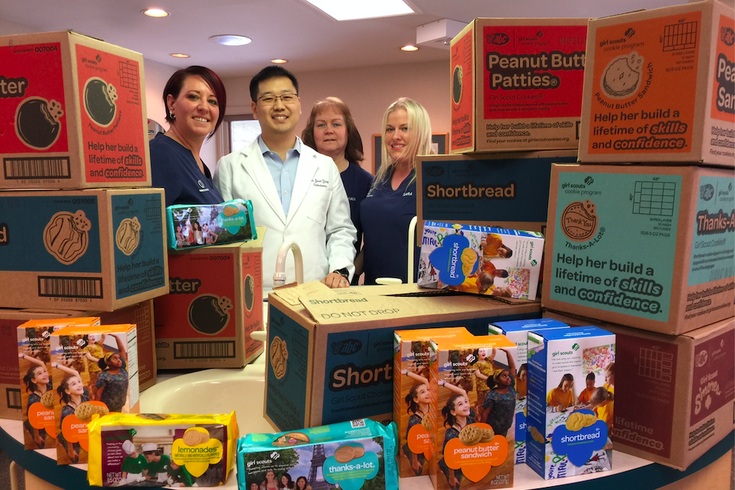 Dr. Jason Yang, a Langhorne orthodontist, shown here with assistants Stacey Richmond, Vivian Burns and Sara Koeppel, has purchased 350 boxes of Girl Scout cookies from patients in the youth organization. He expects to buy another 350 by the time selling season's over, with all the cookies donated to food pantries in Bucks County. Each year, from January to March, the Girls Scouts of America sells 200 million or so boxes of cookies – from Thin Mints (definitively the best), Caramel deLites and Peanut Butter Patties to Shortbread, Lemonades, Do-si-dos and beyond. The mission provides an opportunity for girls to “quickly discover the leader within” and learn essential life skills, while making it a bit more challenging for parents and family friends to honor their healthy New Year’s resolutions. This is the 86th year of scouts selling cookies where it all began in the Philadelphia area, but the first in which a local orthodontist is taking the opportunity to not only help his younger clients, but the community at large. Dr. Jason Yang graduated from the University of Pittsburgh in 2015 and established a practice in the shadows of Langhorne's Oxford Valley Mall – within eyeshot of a water tower that doubles as a beacon for Sesame Place – some six months ago. “We make smiles,” he explained of his chosen profession during an interview on Thursday. In that time, he’d noticed that a lot of his patients were Girl Scouts, so Yang Orthodontics came up with a deal: come to your appointment in your scouts’ uniform, and we’ll purchase five boxes of cookies from you. Those treats will then make their way to a Bucks County nonprofit. Already, Yang – who prefers Caramel deLites – has purchased some 350 boxes of cookies and expects that number to double by the end of cookie season. He said the first year has been a rousing success. The scouts and their parents are thankful for the chance to not only sell more cookies but give back to those in need. Dina Della Ducata, the new CEO of the Family Service Association of Bucks County, said the organization, which offers a wide array of services, greatly appreciates the kindness.